We were asked to update the kitchen cupboard doors and shelves. 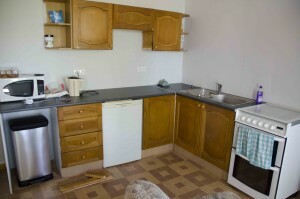 The old kitchen doors and drawers had previously been varnished. All the handles were removed as they were due to be replaced anyway, followed by the removal of the doors from their hinges. It is important to consider that the hinges will need to be re fitted so care will always be needed not to get paint into hinge rebates and holes for handles. All the wood work needed degreasing. This was because the kitchen area would have become contaminated over the years To de grease we used Fluxaf pro-clean diluted at 1 part cleaner 10 parts water. It is important to wear protective gloves for this task as the product is very alkaline and can upset the natural oils in skin. As the doors could be removed it was possible to clean outside so the cleaner was applied from a spray bottle. Inside we applied the cleaner with a microfiber cloth. 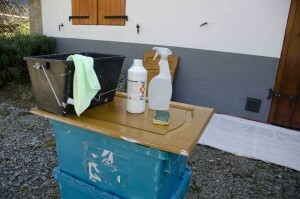 All surfaces were rinsed twice after cleaning. 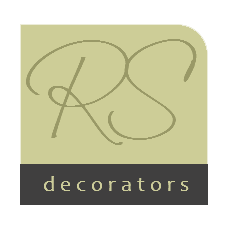 The shelves and doors were sanded with a Mirka Deros sander extracted by a Mirka GB915. 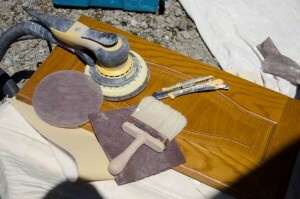 We used several grades of abrasive finishing by hand with Mirka Goldflex soft pads. 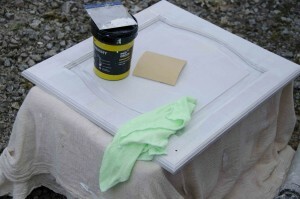 Mirka Mirlon abrasive also proved useful for abrading the mouldings on the doors. An Olfa knife was used where necessary to remove bits of loose varnish. The items were then vacuumed and re cleaned with Krud Kutter gloss off. They were also rinsed to remove any cleaning residue. 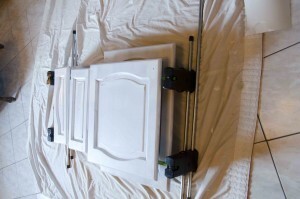 Thanks to the Erecta Rack its easy to apply the coatings to the removed doors. Once a side is coated it can be moved to the rack and the next level of the rack put in place ready for the next door. Of course it does mean that its necessary to wait for the coating on the first side to dry before applying the same principle to the other side. 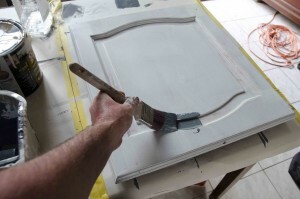 The primer used on the doors was Zinnser BIN. This is a shellac primer which has excellent adhesion and is recommended when going over old varnish. It is fast drying. Where possible is was rolled using a 4inch foam roller with the primer decanted into a Wooster Pelican. The roller is disposed of and the brush left to soak in Virosol cleaner. It's one of the only ways to remove BIN and is inexpensive. 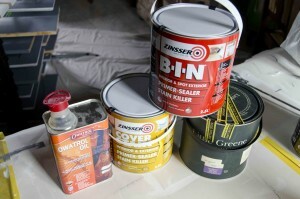 The small shelves in the kitchen were also primed with Zinnser BIN. After the paint had dried it was lightly abraded with Mirka Goldflex 320 grit. The doors were then hoovered and cleaned with a damp microfibre cloth and left to dry. As the doors were to be finished in a grey eggshell we used Zinnser Coverstain as an undercoat tinted to a similar grey. This was also applied with a foam roller and Arroworthy Red frost brush. Owatrol was added to the undercoat which helps flow and extends drying time. It also means the paint levels better. Although Coverstain is dry in a couple of hours it was necessary to wait 24 hours before applying a water based eggshell. In the mean time the new handles were checked and the screws for these were cut to length to suit the doors and drawers in question. The shelves etc were top coated directly over the BIN primer. This is because they were going to be a lighter colour eggshell to match the walls. Also as there was not any brushed areas of BIN on the shelves they were completely smooth. 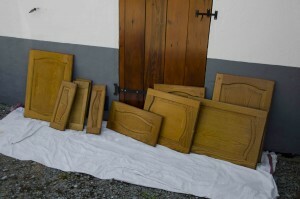 The doors had age related imperfections which the Coverstain helps to mask. Any larger imperfections were filled with Dunlop lightweight filler. Two coats of Little Green eggshell were applied to the shelves with a Proform Contractor brush. A little water was added to the eggshell to help levelling and extend drying time. Lightly moistening the surface with a microfibre cloth and clean water makes it easier to apply the paint. 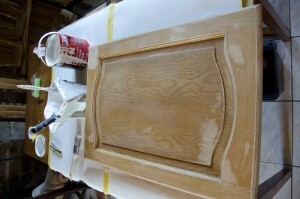 The doors were coated in much the same way as the shelves with 2 coats of eggshell. The backs were coated first with both coats then same procedure applied to the fronts. They were left for at least 24 hours prior to re fitting. The new handles were sourced on eBay for around £40. The work took around 30 hours. 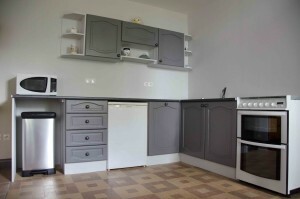 In this case it was a relatively inexpensive way of improving a dated kitchen. Overall it gave the room a more modern cleaner feel.